Nature has a way of creating the most interesting, and fleeting, artwork. If you've ever witnessed the beauty of the aurora borealis (also called the northern lights), then you know those dancing colored vapors are mesmerizing. Recreating those rainbow hues is a splendid way to celebrate your appreciation of Mother Nature. 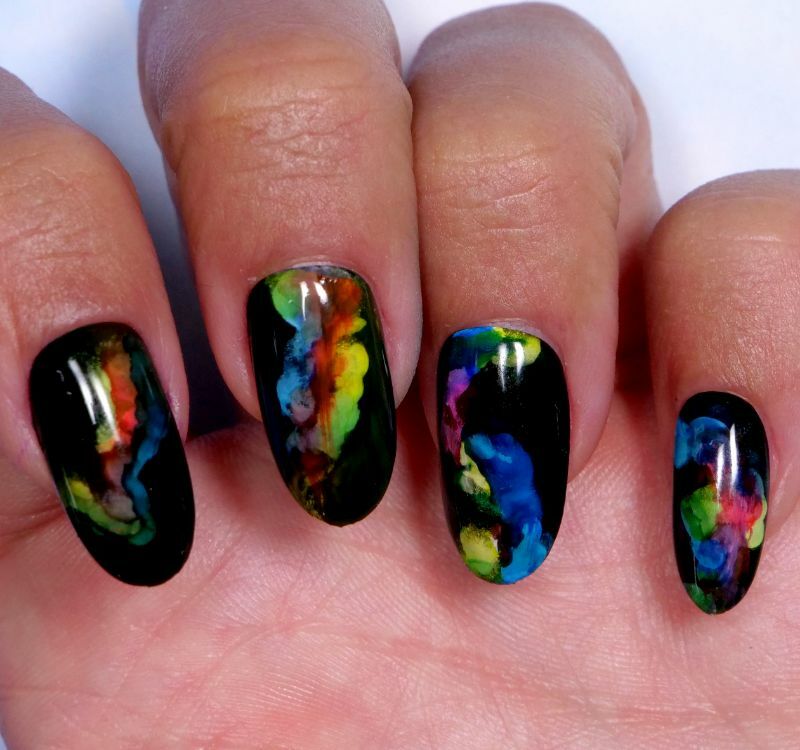 This design uses alcohol ink along with traditional gel polish. The ink is layered over a white "smoke" design, and since this type of ink is watery, the colors swirl together like watercolor paint. A black backdrop makes the design more striking, and the finished design is pure art. 1. Apply two coats of black gel polish to the nails, curing them between coats with the UV or LED lamp. 2. Apply one coat of matte no-wipe gel top coat to the nails, then cure the gel with the lamp. 3. Pour a small amount of isopropyl alcohol into a glass dish. 4. Dip the tip of a lip gloss applicator into the alcohol, then apply one drop of white alcohol ink to the tip. 5. Dab the applicator tip against your nail to create the smoke design. The liquid will be watery. 6. Apply magenta ink to the center of the smoke design, using a blending brush pen. 7. Dip another gloss applicator into the alcohol, then apply one drop of blue alcohol ink to the tip. Layer the blue paint over the white smoke, but leave some white paint exposed. 8. Repeat step seven with yellow alcohol ink. 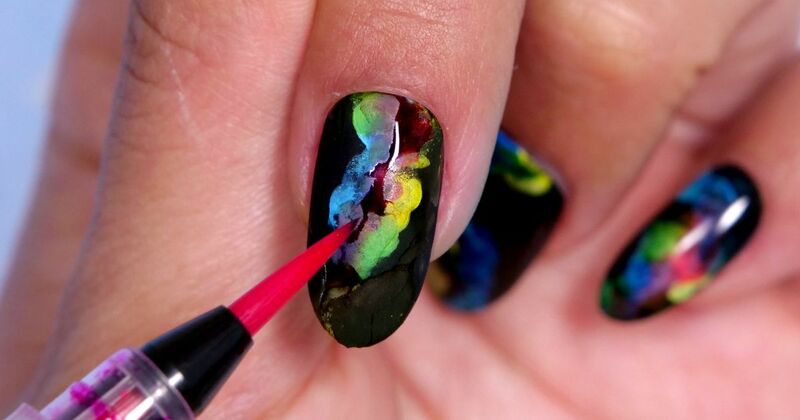 To create green, layer the yellow ink over the blue areas of the nail. 9. Intensify the green areas by applying more blue ink, then cure the ink with the lamp. 10. Seal in the design with a layer of gel top coat, then cure the gel with the lamp. Now, that's some seriously gorgeous smoke! Please share this nail design on Facebook.